IN a village around 50 kilometres off the capital, Anwar Miah has shot to fame for a unique reason. This tiny Bangladeshi hamlet of about 2000 people named him 'Afghan baba', after his second son, Sanu, died for the Talibans in the late nineties. Sanu's mamu (maternal uncle), Zoinal, accompanied him; first to Pakistan's Northwest Frontier Province, then to Kandahar, and saw Sanu die in the battle for Baghram with General Rashid Dostam's forces. Zoinal returned home a month after his nephew's death, because he “couldn't bear it any more.” He hasn't taken back arms since then; but like him, many have returned, and with them have brought extremism to a country once known for religious harmony and tolerance. In fact Maulana Abdur Rauf, leader of Al-Jamiatul Islamia, who was arrested on September 19, in Faridpur with 17 accomplices, told the police that about 500 Bangladeshis went to Afghanistan, of them 33 died. Before the September 19 arrest, the government was vigorous in denying the presence of religious extremists on its soil. The BNP led Four-Party Alliance had banned issues of some international newspaper, including the Wall Street Journal, Time magazine and the Far Eastern Economic Review, for breaking this news to the rest of the world. The reports, though extremely sloppy and in some cases malicious, tried to portray Bangladesh as a hotbed of religious extremism. One went too far in exaggeration-- the article published in the US weekly Time, quoting an unnamed foreign embassy staff in Dhaka, alleged that the country was playing host to Al Quiada's second in command Ayman Al-Zawahiri. The time the magazine had referred to, Al-Zawahiri was seen in a town in Afghanistan. Time didn't apologise for it. The most publicised event in this saga happened last year. After being refused by Bangladesh mission in London, Zaiba Naz Malik and Bruno Sorrentino, two British journalists from Channel 4, concealed their identity and applied for the visa to the Bangladesh Embassy in Rome. Once they were inside the country, however, they made no secret of what they were doing. Police arrested them, along with their two Bangladeshi fixers, accusing them of trying to vilify the country by portraying it as a fundamentalist state. The two were later released, after both journalists, according to their lawyer Ajmalul Hossain, “Submitted statements expressing regret for the situation arising since their arrival in Bangladesh.” The government, however, did not release Selim Samad and Pricilla Raj, who had been assisting them as translators. It was a High Court order that ensured their release. Such was the extent to which the government rejected the presence of religious extremists here. That unwavering stand got a jolt last December when several powerful bombs went off in four-movie theatres in Mymensingh. Investigation began, but it did not deter the prime minister from guessing the identity of the perpetrators: she blamed those “Who are making anti-Bangladesh campaign at home and abroad.” No one expected a price for the right guess--it was the leader of the opposition who told a European audience, only a few days ago, in Brussels, that sympathisers of Al-Qaiada were ruling Bangladesh. That has been Sheikh Hasina and her party, Awami League's (AL) staunch line of thinking since the first such incident ripped off a cultural function in Jessore. Like the Bangladesh Nationalist Party (BNP) in power, AL, then in the helm, was quick to discover the perpetrators-- even before the primary investigation had begun, it blamed the religious zealots, “under the shelter of the opposition” for the incident. BNP, then the main opposition, was quick to condemn the incident, and bizarrely, it fed several conspiracy theories, amongst them, one accusing the AL of planting bombs in public places to reap political dividend. 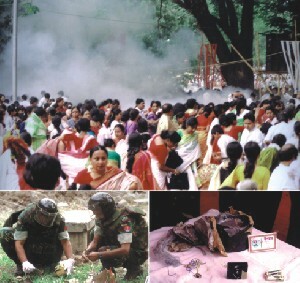 HUJIB hit the headlines of local and international dailies when the group was charged with planting two bombs at a meeting that was to be attended by the then prime minister Sheikh Hasina in her home district Gopalganj. “The mission of HUJIB, led by Shauqat Osman, is to establish Islamic rule in Bangladesh," says a US State Department report. It has an estimated cadre strength of more than several thousand members and it operates and trains in at least six camps,” says the State Department, which has already listed HUJIB as a terrorist organisation. So far, little has been known about the group and its elusive commander Shauqat Osman, who is also known as Sheikh Farid. According to reports on the western media, HUJIB was formed in 1992 in Afghanistan to fight the Soviets. Ironically the US administration actively supported the Mujahidins, fighting the Russians in Afghanistan, with arms and military logistics. “Originally, it (HUJIB) consisted of Bangladeshis who had fought as volunteers in the war against the Soviets in Afghanistan,” JIR says. But, the country is in no way a fertile ground for religious intolerance. “Bangladesh is far from becoming another Pakistan, and the rise of extremism should be seen in the context of the country's turbulent politics since breaking away from Pakistan in 1971. Bangladesh was formed in opposition to the notion that all Muslim areas of former British India should unite in one country. Bangladesh is the only state in the subcontinent with one language group and very few ethnic and religious minorities,” Jane's Intelligence Review says. 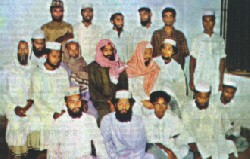 The country's biggest religious party, the Jamaat-e-Islami Bangladesh was banned immediately after independence for actively supporting the Pakistani occupation forces by forming several armed militia groups during the liberation war; the ban was lifted later on, and it was allowed to operate as a political party. During the eighties, under a military dictatorship, Jamaat's appeal to establish Islamic law and good governance received a lukewarm response from general people. In fact it was during that period Jamaat managed to get a significant number of recruits by luring them into the path of Islamic revolution. In 1991, in the first general election, the party had managed to get 18 seats in the national parliament. But once they were in democratic politics, the leadership begun to lose its charm offensive. Jamaat's coalition with the AL, then seen as a moderate left and a staunch secular, irked many of its radical supporters. The AL ditched Jamaat before the general election, but it couldn't stop several disgruntled mid and lower ranking Jamaatis to openly voice their opposition against the party leadership. “There is a huge gap between the ideology Jamaat wants to establish and the way they are doing it,” says Mahmudul Islam. “No one in the Jamaat leadership has sent their children to Maadrassahs (Religious schools),” he continues. “On the other hand,” Mahmud believes, “they led a lifestyle that is an antithesis to everything true Islam stands for.” Extremists groups have quickly filled up the ideological vacuum; these parties cannot be called Jamaat's natural offshoots, but they definitely constitute an ultimate by-product of its ideological failure. “It has happened before; in the sixties, the failure of a relatively moderate Communist Party had given birth to several Marxist extremist factions,” Mahmud says. Meanwhile the extremists, as elsewhere in the world, have been receiving an otherwise unusual assistance from an unwitting foreign administration. “George W Bush's foreign policy and his so-called war on terrorism have been helping the mullahs to allure a nation, already angered by the US occupation of Iraq and its regular assistance to the Israelis,” says Mahmud. “The whole situation is chaotic. BNP doesn't believe the terrorists exist, because the Awami League is pointing fingers at Jamaat, which is the BNP's main political partner in the coalition government. The AL is creating a hoopla out of all this because they want to undermine the government. The US, on the other hand, is busy with its own war, driven more by oil than anything else. Religious fanatics are microscopic minorities here, true. But then, so were the Talibans before they took over power in Afghanistan…” Mahmud says.